Invented by the founder of Pilates, Joseph Pilates, the Reformer is a sophisticated machine with a system of springs, straps and pulleys that allows the user to perform over 200 different types of exercises. The Reformer glides forwards and backwards on rollers and uses the springs, leverage and own body weight for resistance for a wide variety of exercises and positions (i.e. lying down, seated, and standing). 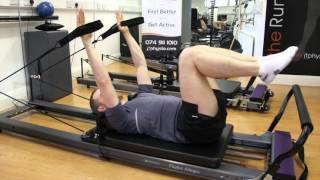 Have a look at our information video for a detailed description of the ins and outs of Reformer Pilates. The reformer offers all the benefits of mat work Pilates including overall strength, flexibility, coordination and balance with one additional beneficial feature, namely eccentric muscle contraction. This is when a muscle lengthens as it resists a force. The reformer is a set-up for eccentric contraction which is key to achieving long, strong muscles without bulk. Reformer Pilates is no-impact (and therefore easy on the joints) and accommodates full-range motion which is great for increasing flexibility and building strength – making it very suitable for patients with injuries. It facilitates three-dimensional movement and conditioning, and is suitable for a wide variety of clients from rehab to professional athletes. The Reformer machine parts are adjustable depending on the user’s body size and level of skill, which makes exercising with the reformer possible for anyone, at any level of fitness and especially those with injuries. This 1 hour class will fly by with endless exercise possibilities, so be prepared to have fun while improving your flexibility, muscle tone, and core strength! Warning – Reformer Pilates are extremely addictive! All new clients must complete a Welcome Special, before joining the group class. This session enables the instructor to teach you how to use the Reformer equipment correctly, identify postural issues and previous injuries we may need to focus on, set goals and determine which level of group class is best for you. It is a fantastic opportunity to get the most out of your Reformer Pilates classes. The introductory session will personalise your experience, will identify your level of ability in a safe environment and ensures you get best value for money.